Have you been wanting crockery with gorgeous intricate designs on it? Do you generally avoid buying it because it’s expensive? Not unless you’re at Rose Collection at Musafir Khana – the good old market next to Crawford Market – where crockery is available at cheap, wholesale prices and the variety is more than you’d ever imagine. We’ve always been fans of fine, intricately designed crockery. We’ve previously mentioned how we love the stuff at Cyahi, and now, we’ve just found crockery heaven in the form of Rose Collection at Musafir Khana. 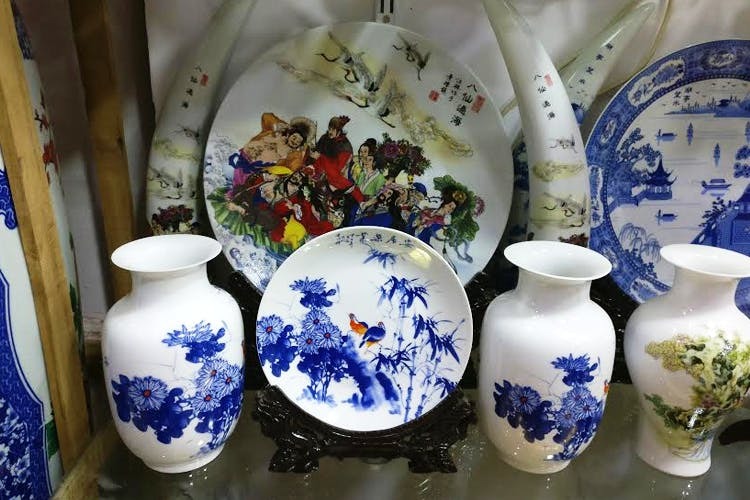 Firstly, all of this market is famous for selling varieties of crockery and home utility items for cheap, but Rose Collection is a different ball game. Really. Located in the Musafir Khana building (in the lane of Gulshan-E-Iran) this shop is paradise for those who love decorating their homes with unique plates. If you’re clumsy by nature, please walk around carefully inside this store because you will be surrounded by plenty of glass all over - from plates to dinner sets to show pieces to lampshades and whatnot. The gorgeous, blue design plates we love so much are available here for INR 800 upwards, the blue design kettles for wall pieces are available between INR 800- INR 1,200, while regular use kettles and cups start INR 500 upwards. An entire 37-piece glass dinner set will cost you INR 13,000 here (with amazing designs) while a tea-set with really amazing work will set you back by just INR 2,000. They also give awesome combos of two designed vases and a plate for INR 1,800 while those eye-catching lampshades (so gorgeous) will cost you INR 2,500. We honestly love everything here because the quality of the products is good, the variety is a lot and the staff is super helpful- they even take you to another store behind if you nudge them a bit. They're expecting new stock in the new year, so there's a lot to look forward to! If you’ve just started doing up your home, a visit to this shop is a must. And in general, take a stroll through Musafir Khana because you never know what you will find where.